Georgian President Giorgi Margvelashvili has didn't achieve an agreement with the civil sector over the format of choosing a new head of the Supreme Court of Georgia after the resignation of Nino Gvenetadze in early August. President wished the civil sector to name the candidate for the role, while the NGOs stated that they would not take the responsibility and called on Margvelashvili to nominate the candidates himself, as the law reads. NGOs say that they can only evaluate the candidates offered by the president. "We said that we would monitor the process, so we cannot offer a particular candidate, as this is the responsibility of the president. He should undertake political responsibility for the candidate that will be submitted to the parliament,” Eka Gigauri, head of the Transparency International Georgia said. Margvelashvili has a chance to name the candidate until he is the president, as the new presidential race is scheduled on October 28. The candidate nominated will be the last one named by the president, as after the elections legal amendments come into play which deprives the president of the right to nominate the candidate for the Supreme Court chairperson. 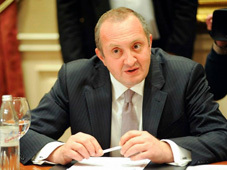 At the meeting with the NGOs Margvelashvili said that the new candidate should be free from political influences. "Today we have gathered to discuss the issues related to the most important branch of our country, which has repeatedly been the subject of the recommendations of our partners. The problems were especially exposed when the chairperson of the Supreme Court resigned. “The resignation is not a problem, but the Supreme Court chairperson’s statement that she became a victim of pressure was problematic. Today we are in a special situation to promote the development of the court and, naturally, the Supreme Court chairperson is very important in this process,” Margvelashvili said. In her last statement in the role Gvenetadze, who was selected by the president and approved by parliament in 2015, said that she left the post because of the health problems. However, several months before the resignation Gvenetadze was speaking about the pressure on her on the way to genuine court reforms. The Georgian Dream ruling party members have “advised” the president to, first of all, assess his decision about Gvenetadze, whether the choice was correct or not, and only after select a new candidate. Gvenetadze should have taken the post for more seven years as the Supreme Court heads are elected for ten years.